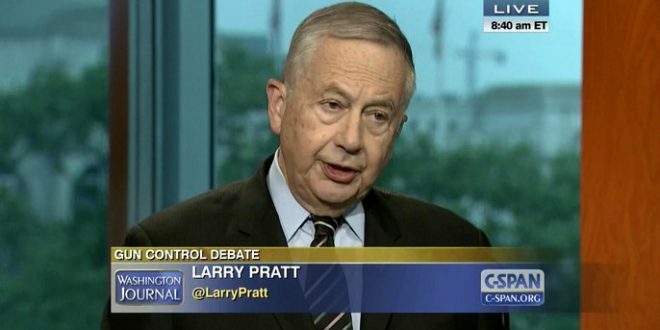 Gun Rights Leader Larry Pratt Blames Texas Mass Shooting On "Hate-Filled Liberal Democrats" - Joe.My.God. A hate-filled killer is to blame for murdering innocent churchgoers in Texas, not the firearm he used, says the leader of a gun-rights organization. But law enforcement authorities have downplayed anti-religious beliefs as a motive, stating publicly that a domestic dispute with Kelley’s ex-in-laws may have triggered the rampage, since he had threatened his ex-mother-in-law days before the shooting. PREVIOUSLY ON JMG: In 2013, Pratt appeared on a far-right extremist web show to discuss the secret black army Obama was organizing to massacre white Americans. Later that year he spoke at loony bird Larry Klayman’s rally calling for overthrowing the federal government.